What a fabulously serene paddle. I spent over three hours on the Ocklawaha River, and I was the only person on the river the entire time. I paddled eight miles, from Gores Landing to the Ocklawaha Outpost, a paddle Ohr and Carmicheal describe as a “twisty, naturally gorgeous side trip to the northeast.” It was an easy paddle; I was paddling with the current and had a strange sense of floating downwards the entire trip. The gradient on this river is 1.4—meaning it drops 1.4 feet per mile—just slightly higher than that of the Silver River which is 1.0. This river flows north, and it eventually flows into the St. Johns River which also flows north. The water seemed high and spread into the trees on the banks. It was a beautiful, mirror-like, flooded river. So, it was just me and the river…and the critters around me. I could hear the birds calling to each other in the trees. Later, I discovered that some of those sounds may have been monkeys. I saw five alligators along the way, but they didn’t care much about me. It was easy to imagine that I was in a Tarzan movie or on the Jungle Queen; this was the wilderness. I just floated and paddled with the current and listened to nature around me. What a life! I saw only a few birds; perhaps because the water was so high they stayed deeper in the woods. The trunks of the trees on the banks were weathered. The vegetation was much like that on the Spring River including cow lilies, water hemlock and water hyacinths. I spoke with two women on the Spring River the day before, and they referred to the Ocklawaha as “sweet tea” because of its dark color. I would add “very strong” to that. The water was caramel-colored, and I couldn’t see through it. It was probably a good thing. The young girl at Ocklawaha Outfitters said that the gar fish are typically four to six feet long. Yikes! 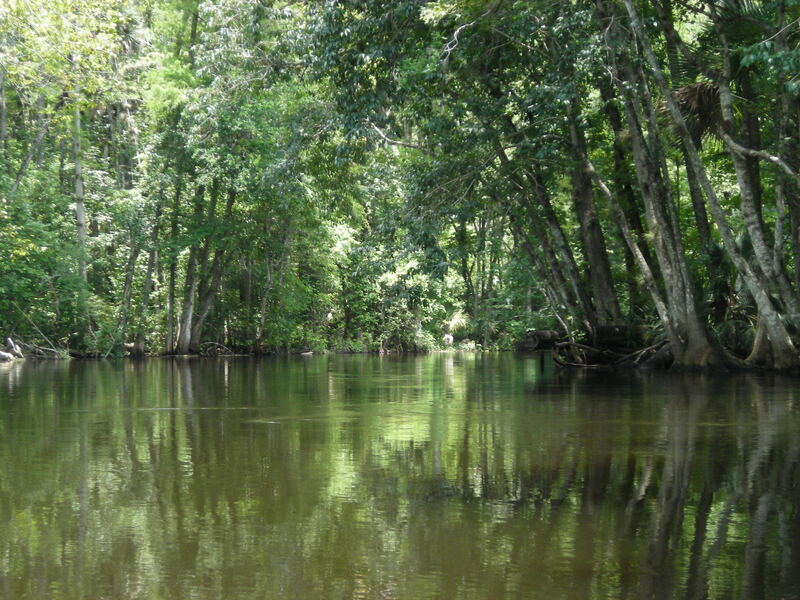 The Ocklawaha is another “must paddle again” river. Mike O’Neal, the owner of the Outpost, suggested that next time I paddle , I should paddle from Ray Wayside Park on Highway 40 and end at Gore’s Landing (where I began today). He said that besides being a lovely, scenic trip, the monkey sightings are frequent. By the way, the Ocklawaha Outpost was the friendliest outfitter so far. It is family-owned; the O’Neils have owned it for just over a year. I met Mike and his daughter, Cassie. Cassie showed me a couple of the cabins they rent—just in case I come back for the other run. They were cute and very clean. Malin, one of the employees who drove me to Gore’s Landing, told me all about the alligators and snakes in the river. The Outpost rents sit inside kayaks—Loons, and this was the first time I had used this type of kayak. Once I got use to it—and after hearing the alligator and snake stories from Malin—I felt much more secure! I am definitely going to paddle this one. This one you really should kayak–but consider the other stretch that I mentioned. The Ocklawaha River has been at the center of an ongoing contoversy since Rodman Dam was constructed as part of the Cross Florida Barge Canal, a federal project authorized in 1964 by the Johnson administration, but halted by the Nixon government under new EPA regulations. The river was also important to Confederate smugglers during the Civil War; they hid out from much larger Union patrol boats on the St. Johns. After the war, southern poet Sidney Lanier wrote of the Oklawaha in a travel book as “the sweetest river lane,” steam boat tours being a major attraction in the late nineteenth century. Former President U. S. Grant was one notable visitor. These rivers all have such interesting history, and they are all so beautiful. However, I do believe that the Ocklawaha has been my favorite so far. Thank you, it’s one of my favorite rivers!